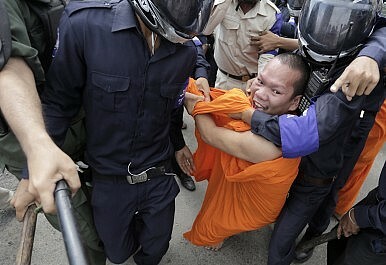 A Buddhist monk is detained by Cambodian police officers during a protest, calling the court to release seven detained protesters, in front of Phnom Penh Municipal Court, in Phnom Penh November 11, 2014. Ten land rights activists from Phnom Penh’s Boeung Kak Lake receive a royal pardon. After a lawyer and lawmaker for Cambodia’s opposition Cambodia National Rescue Party (CNRP) announced that negotiations between the ruling party and the CNRP had taken place over the release of imprisoned activists and opposition politicians, ten land rights activists from Phnom Penh’s Boeung Kak Lake received a royal pardon and were released from prison on Saturday afternoon. The news of their release was also welcomed by human rights organizations, who have been campaigning for the activists’ release and who had criticized their initial conviction. Rupert Abbott, Amnesty International’s Research Director for Southeast Asia and the Pacific, said in an email that the organization was “very pleased to learn this news. [They] should never have been arrested in the first place. That they have had to endure imprisonment since November 2014 only for exercising their right to freedom of peaceful assembly is appalling. On November 11, 2014, seven women from the Boeung Kak Lake neighborhood – women who are all on the frontlines of the fight for the community’s right – were arrested while holding a protest to demand that the city’s government address the problem of flooding in their community. The next day, three more activists, in addition to a Buddhist monk, were arrested, this time outside the courthouse where they were protesting the arrests of their fellow community members. Within 24 hours of the arrests, all had been tried and convicted. The activists were charged with “obstructing public traffic,” sentenced to one year in prison and fined $500. On January 22, 2015, Cambodia’s Appeal Court heard their case, and on January 26, upheld their convictions, although reducing some of their sentences. Human rights organizations have decried these convictions as yet another attempt by the Cambodian government to silence those who voice criticism of its policies and actions. Since the Cambodian government signed a deal with a private company, Shukaku Inc., in 2007 for a 99-year lease of Phnom Penh’s Boeung Kak Lake, previously home to more than 4,000 families, a group of women from this community have emerged as some of Cambodia’s most determined and unrelenting activists. Organizing regular demonstrations and marches in front of government buildings, foreign embassies, and United Nations offices, they have, over the years, become a symbol of Cambodian human rights activism. However, this activism has come at a price. The women of Boeung Kak Lake have been repeatedly beaten by security forces during protests, and these latest convictions followed a long spate of similar miscarriages of justice. In 2011, four of the women were arrested and charged with “obstructing public officials” and “insult” – Amnesty International called the charges “politically motivated.” A year later, in May 2012, 13 of the activists were tried in just three hours; all were convicted and sentenced to 30 months in prison, a move again criticized by human rights NGOs. Although their sentences were suspended during an appeal hearing a month later, activist Yorm Bopha, who had been leading the fight to see the 13 released, was herself arrested and convicted on what human rights organizations have repeatedly lambasted as bogus charges later that year. When Bopha’s appeal was heard by the Supreme Court in November 2013, Ou Virak, then president of the Cambodian Center for Human Rights (CCHR), noted: “it has been clear from the very beginning of this case that Yorm Bopha has been targeted for her activism in the context of the Boeung Kak community’s struggle for their rights.” And while Bopha’s release by the Supreme Court pending a new trial – which has yet to be scheduled – was celebrated both in Cambodia and abroad, these new arrests have done little to assuage concerns that the Cambodian government will continue to use the justice system to silence these activists. These concerns are compounded by the fact that it is not only the women of Boeung Kak Lake who face judicial threats. Independent radio owner Mam Sonando was arrested in July 2012 on insurrection charges, despite the absence of any credible evidence to support these claims. NGO leaders and other staff have similarly been threatened with legal proceedings, among them Yeng Virak of the Community Legal Education Center, Leang Sokchoeun of LICADHO, Chan Soveth of ADHOC, and, most recently, staffers of Equitable Cambodia, amongst many others. In August 2011, Samakum Teang Tnaut (STT), an NGO often critical of the government’s land and development policies, was suspended by the Ministry of Interior. Under international pressure, sentences for activists who have been convicted are often suspended or reduced – but rarely are they overturned. Their guilty verdicts usually stand, putting the activists at further risk of arrest and imprisonment. Frequently, activists are also required by the authorities to sign letters in which they pledge to stop partaking in future demonstrations or other “illegal activities” in order to be released or to avoid charges. Local and international human rights organizations, as well as the now-former UN Special Rapporteur on Cambodia, Surya P. Subedi, have long held that Cambodia’s judiciary suffers from a chronic and widespread lack of independence, and that it is too often held hostage to political interests. It is notable – and perhaps telling of the rationale behind these convictions – that the Appeals Court reduced the sentences of all but two of the defendants: Tep Vanny, who is perhaps Cambodia’s most well-known human rights activist, and the Buddhist monk, Venerable Seung Hai. Juliette Rousselot is a freelance journalist & human rights/development researcher currently based in Kathmandu, Nepal.